Nicholas Daniel founded the Britten Oboe Quartet together with his colleagues and co-principals of the award-winning Britten Sinfonia; they all bring to this ensemble not only the highest musical standards but also the experience of playing together over many years, resulting in warm, expressive and above all enjoyable playing. They aim to bring music of the highest quality to audiences and to explore lesser-known works, both British and from abroad, as well as standard classics such as Mozart’s Oboe Quartet. 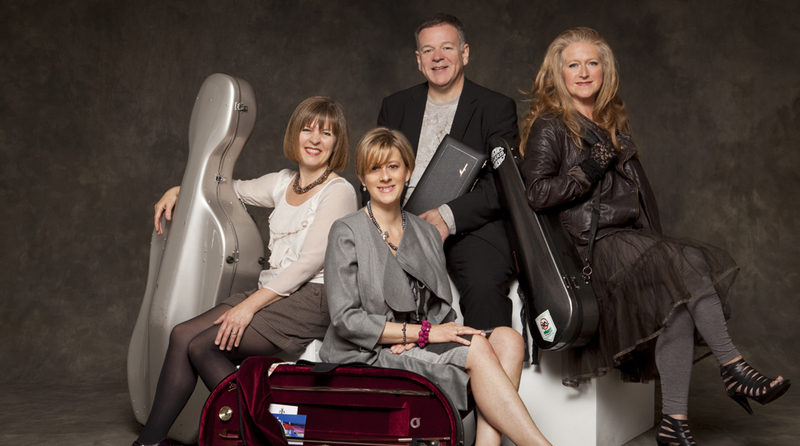 The Quartet’s repertoire includes oboe and cor anglais quartets by Britten, Berkeley, Knussen, Elgar, Krommer, Françaix, Gordon Jacob and Elisabeth Lutyens. Its imaginative programming embraces repertoire other than the oboe quartet, often including string trios, solo works such as Britten’s Metamorphoses after Ovid or other chamber music combinations. It relishes the challenge of programming a well-balanced and attractive concert in line with specific themes and can be sure to find something new and interesting for every concert. The Quartet has been heard up and down the UK, from Aberdeen to the Gregynog Festival in Wales, Swaledale and Wimbledon Festivals, Oxford, Brighton, and Wigmore Hall and Kings Place in London. Its most recent UK tours have included the RNCM in Manchester, Sheffield and Keele Universities and Djanogly Hall in Nottingham. Its debut recording will be released on the Harmonia Mundi label in 2017. Nicholas Daniel’s long and distinguished career began when, at the age of 18, he won the BBC Young Musician of the Year Competition. As one of the UK’s most distinguished soloists, he has become an important ambassador for music in many different fields. In recognition of this, he was awarded the prestigious Queen’s Medal for Music. Nicholas has been a concerto soloist with many of the world’s leading orchestras, working under conductors such as Edward Gardner, Sakari Oramo, Roger Norrington, Jiri Belohlavek, Mark Wigglesworth, James MacMillan and Mark Elder. In addition to his experience in Baroque music, he has premiered works by composers including Harrison Birtwistle, Henri Dutilleux, Thea Musgrave, John Tavener, James MacMillan and Michael Tippett. His recording of oboe concertos by Vaughan Williams and MacMillan was awarded the BBC Music Magazine Premiere Award in 2016. He is oboist with Britten Sinfonia and Artistic Director of the Leicester International Festival. He teaches in the UK and in Germany, where he is Professor of Oboe at the Musikhochschule, Trossingen. He made his conducting debut at the 2004 BBC Proms with Britten Sinfonia. He has conducted many projects with the orchestra over 20 years, including many new works, and recently conducted orchestras in Finland and Norway. An active chamber musician, Nicholas is a founder member of the Haffner Wind Ensemble and the Britten Oboe Quartet, whose debut disc will be released on the Harmonia Mundi label in 2017. He also regularly works with the pianists Charles Owen and Julius Drake, and with the Carducci and Vogler String Quartets. PLEASE NOTE: A major event takes place at nearby York House the same evening, so parking will be severely restricted. There is however excellent public transport!